Marjolyn was the daughter of creative and adventurous parents. Immigrating to Canada from the Nederlands in the late 60s, Marjolyn’s father began his life as an artist. She watched her father develop his art and business of selling art in the Toronto area. His passion for the ability to be free from the constraints of an corporate path inspired Marjolyn to follow a similar route. However, life was not as linear as expected. Marjolyn began by completing a BA with Honours at Carleton University studying Mass Communications and following this a BFA at Ringling School of Art and Design in Florida. During this time, Marjolyn studied in New York City at the New York Studio Residency Program which was affiliated with the Parson’s School of Art in the 90’s. Since completing school, Marjolyn has lived in Toronto with her husband and two children. 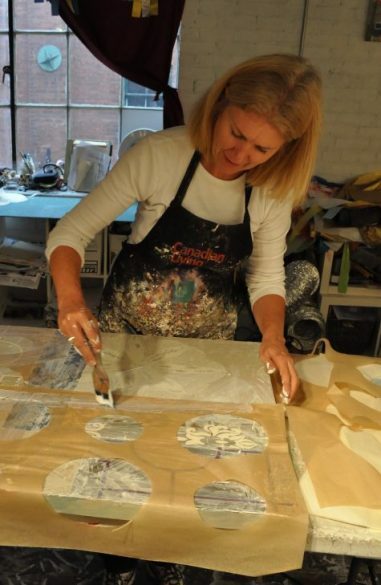 She travels extensively throughout the USA showing her work at highly competitive Juried Art Fairs and is represented by Petroff Gallery and Wall Space Gallery in Canada. Her work has won several awards and has been shown at Affordable Art Fairs in New York City and Los Angeles. This work has a dialogue between the digtial references and expressionistic brushwork. The hand is present. Marjolyn’s process is unique as she has creates her work in several stages. Working with vintage wallpapers and tissue paper, Marjolyn initially creates an abstraction that attempts to create a “feeling” of a story. The patterns, and layers of tissue paper, meld together to create an ephemeral vague dimension of space. Once this has dried, the story is introduced with digital layering, pastels and acrylic paint. Imagery is introduced in a surreal nature so that the viewer is brought into the whimsical nature of the scene. Every image tries to touch on the personal realm of the viewer. It may remind us of a significant person in our life who filled it with connections and reality. Or it may convey a feeling of a place of release in which we are free from demands of work.